The University of Ulster’s Belfast Campus principally accommodates students from within it’s very popular and highly respected Faculty of Art and Design. The campus had seen limited investment until 2004 when, to cater for an anticipated doubling of its student population, the University embarked upon a restructuring, refurbishment and major extension of the existing facilities. The University were seeking to encourage interaction and collaborative programmes between students and staff within the differing departments, and to breakdown the ‘territorial’ approach to space, so commonly evident in the third level sector. The design response establishes a sense of openness, with accommodation organized around two naturally lit atria, and a flexibility in internal arrangement, both in terms of plan layout and shared departmental use. ‘In-between’ spaces also contribute significantly to the new learning landscape, with for example the glazed bridge linking the two parts of the campus, designed as a display, presentation and casual meeting / study space. The campus redevelopment is the most important infrastructure project undertaken by the University since its creation in 1984. There was a desire consequently for a piece of landmark architecture that would re-establish its presence in the city centre, and provide a catalyst for the urban regeneration of the Cathedral Quarter area in which it sits. The buildings’ carefully articulated form, and engineered facades of natural stone, bronze panels, glazed screens and projecting solar shading, achieves these goals in a understated yet confident manner. The University is committed to improving the energy performance of all buildings that it procures. The campus has a zero carbon energy strategy with ‘Tri-Generation’ – combined heat and power units utilised in conjunction with an absorption chiller, coupled with exposed concrete slabs that provides natural ‘coolth’ and engineered facades controlled under the BMS. 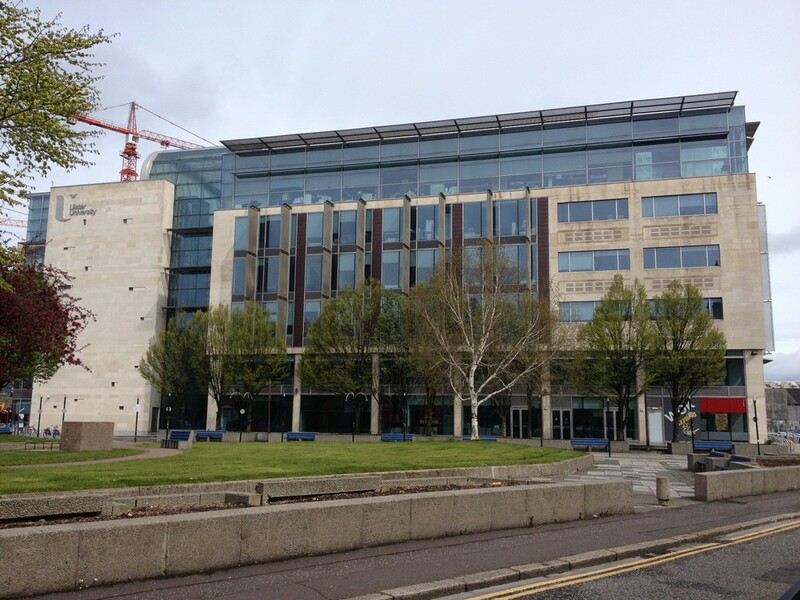 Belfast campus is situated in the artistic and cultural centre of the city; the Cathedral Quarter.